I thank the reader who brought to my attention Penguin's covers for the new Canadian editions of Howard Engel's Benny Cooperman mysteries. The one to your right is worth a comment even before I begin reading it. Note the wheelchair, the thought balloon and the title's backwards B. These are, presumably, references to an affliction shared by Cooperman and Engel. Like his protagonist, Engel suffered from alexia sine agraphia, a condition in which the sufferer can write but not read. (In Engel's case, the condition resulted from a stroke. I don't know the protagonist's circumstances.) This obviously must have been a terrible blow for an author to overcome, and I believe the cover design captures that beautifully. Oliver Sacks, the neurologist and author who has written with much understanding about any number of strange neurological conditions, wrote an afterword to this book, which leads me to suspect that the cover's hints at mental and physical struggles accurately reflect the book's contents. Next: Toronto is widely known for the numerous movies filmed there but set in other cities. In the coming days, I'll be discussing a crime novel that makes Toronto so cool that producers may soon want to start shooting movies in other cities and pretending they're Toronto instead of the other way around. Apropos of my recent reading of Bertie and the Seven Bodies by Peter Lovesey, Lee Goldberg posts a relevant criticism of the new Get Smart movie. The problem with that movie and with Steve Martin's Pink Panther remake, Goldberg writes, is that "someone made the inept decision to make the bumbling heroes smart and capable ... and very good at what they do." This, he says, robbed the two protagonists of that which made them so funny: the gap between their inflated estimates of their own capabilities and what they were actually capable of. Lovesey's Bertie, Prince of Wales, is similarly good-hearted and similarly deluded about the extent of his own capabilities as a sleuth. Lovesey has fun with this delusion literally from the novel's opening page: "Damnit, one small oversight and I'm branded as a failure. If I'd looked in the wretched wastepaper basket my chain of reasoning would have been different, altogether different." And now, readers, what are your thoughts on crime-fiction bumblers? Who are your favorite such characters? Why do you like them? How would your feeling about them change if they were more capable and less prone to bumbling? With the first Noir at the Bar reading safely in the can, Detectives Beyond Borders is pleased to present Noir at the Bar II on Sunday, July 6. This second crime-fiction event at Philadelphia's Tritone bar will feature Jonathan McGoran, who, under the name D.H. Dublin, has written three forensic thrillers published by Penguin. The novels feature Philadelphia forensic investigator Madison Cross, and McGoran lends his sometimes grim subject matter a human touch by following Cross from the beginning of her career as a crime-scene technician. This, McGoran says, lets the reader learn along with her. And the reader just may learn quite a lot. One reviewer wrote that "If you are tired of all the unrealistic CSI shows and books and are looking for an author that delivers realistic crime scene and investigative procedures, D.H. Dublin is the author you are seeking. " The Noir at the Bar reading should be especially enjoyable because McGoran does a terrific job with his characters' voices. varying them enough to keep things interesting without, however, going over the top. He also has a tendency to giggle at the gory parts, which lends his readings an unexpectedly delightful and macabre touch. So, if you're anywhere in the Northeastern United States a week from Sunday, drop in to the Tritone. Come for the reading, stay for the music, the mahi-mahi burgers, and the fried Mars bars. When: Sunday, July 6, 2008 at 6 p.m. I don't know how applicable this is to authors other than the one in question simply because few have written as many crime fiction series over so many years. So think of this post as some interested comments on the ways of Donald Westlake. "Parker yawned. `Nothing on the phone ever,' he said. `Except pizza.'" Earlier incarnations of Parker never would have cracked wise like that. Now would they, upon being told by a bounty hunter that "The last time I saw you, you were driving a phony police car," have replied: "The police car was real. I was the phony. You were there?" Similarly, Comeback, the 1997 novel that revived Parker after a twenty-five year hiatus, opens with the sort of farcical touch far more characteristic of Westlake's comic caper novels about John Dortmunder than of the pre-hiatus Parkers. The tone is grimmer, but the comic touch is decidedly present. Elsewhere in the sprawling Westlake/Stark oeuvre, recent novels seem touched by the sombre sympathy for the economically hard-pressed that marked Westlake's novel The Axe. That book's protagonist is a laid-off executive driven to extreme acts by his induced unemployment. In the 2006 Parker novel Ask the Parrot, Stark/Westlake drops the earlier device of having Parker assemble a string of specialists to pull a robbery. Instead, Parker joins forces, against his will at first, with an embittered recluse to rob the racetrack that laid him off unfairly. The cross-series boundary jumping also marks what might be Westlake's finest work, Walking Around Money, the Dortmunder novella that forms part of the Transgressions series edited by EdMcBain. The goings-on are farcically funny, as they usually are with Dortmunder, but the vignettes of a troubled upstate New York town are touching. So, what about it, readers? What other crime writers have, if not quite borrowed from themselves, let one corner of their work influence another? In an example of the creative synergy that starry-eyed Web boosters claim has transformed our consciousness (either that, or in a bit of copycatting born of laziness on my part), I refer you to Chocolate Cobweb's display of Ngaio Marsh book covers from 1944 through 1987. It's interesting to note how styles change over time and to speculate about how different aspects of an author's work capture designers' attention in different eras. It appears that Ms. Cobweb has now posted a similar display of Agatha Christie cover, which ought to fuel your appetite for this question: What examples come to mind of covers from different eras that highlight different aspects of an author's work? Will a cover from an apprehensive era focus on darker aspects of a writer normally considered cozy, for example? Readers responded in gratifying numbers to my request for creative ways crime writers could sponsor public services, along lines pioneered by Peter James and the Brighton and Hove police force. I had promised to award books for the five best proposals, but I could not decide between numbers five and six, so I will award six books instead. 1) Philip, for his suggestion that Ruth Rendell could have had “a nice arrangement with the White House” based on titles that include Some Lie and Some Die; Going Wrong; Put on by Cunning; and The Secret House of Death. 2) Lauren, for her tasty suggestions that Andrea Camilleri’s Salvo Montalbano and Donna Leon’s Guido Brunetti could lend their names to a campaign for healthier school lunches (and I’m sure Lauren would not object if I included Paola Brunetti as well). 5) Linkmeister, for a related and equally unlikely suggestion that The Taking of Pelham 123 would make an ideal sponsor – or is today’s preferred term corporate partner? – for bus and subway timetables. 6) Crimeficreader, for suggesting Chris Simms’ novel Outside the White Lines as a natural for emblazonment across the sides of traffic patrol cars on motorways in the United Kingdom. She wins special commendation for creative cross-marketing synergy for suggesting that Simms’ novels could also be stocked at motorway service stations. Congratulations to the winners and thanks to all who entered. I shall be in touch with lists of the available books. I recently singled out J.F. Englert's entertaining and highly worthwhile A Dog Among Diplomats for its explorations of canine consciousness, particularly in a series of meditations on scent. I called those meditations "nice pieces of fantasy writing," but I realize they are probably also the result of clear-eyed planning on Englert's part. I don't know Englert's thinking as he planned the book, but, having decided to make an animal his narrator, he obviously then had to decide how this animal would communicate with the book's human characters. This is where readers who blanch at the thought of animal characters may start to roll their eyes, queasy with visions of cute dogs yelping and trying to pull their masters back from walking unknowingly into perilous situations. Happily, Englert's book has none of that. A hilarious dog book would have been filled with such scenes. A sentimental dog book would have mused upon the beautiful ways dog and man communicate. Englert, however, recognizes that such communication is fraught with uncertainty, to say the least, and he makes such difficulties a large part of the book. In that respect, A Dog Among Diplomats is rather realistic for a story with a fantastic premise. Faced with a problem, in other words, Englert decided not to solve it, but to make the problem into the substance of his story. What other clever, realistic solutions to thorny narrative problems come to mind? What other writers have taken what might have been a stumbling block and made it instead into an important part of the story? When the judges of the Duncan Lawrie International Dagger wrote that Martin Suter's novel A Deal With the Devil "pays literary homage which modernises Glauser’s plot and setting, while extending it into an original conception of [its] own," I sat up and took notice. Glauser was one of the greatest of crime writers, and if his name is on it, I'll buy it. I wondered, though, how Suter had modernized the book, and I wondered further about the variety of ways an author can modernize or update a favorite book or story. My copy of A Deal With the Devil arrived this week, and the rear-cover blurb describes a woman, Sonia Frey, tormented by synaesthesia: She feels smells, and she sees sounds. Glauser notably empathized with downtrodden characters in his novels. Perhaps Suter's deeper exploration of Sonia Frey's consciousness is an extension of Glauser's empathy. Perhaps the CWA judges had this in mind when they spoke of Suter's having modernized his illustrious countryman's plot and setting. If you've read Glauser and Suter, what do you think? If you haven't, tell me some of the more interesting ways authors can update older stories. A blog that bears the tasty name Chocolate Cobwebs posted a shot of this cover recently, and I was surprised when I noted the book's author and title. The illustration seemed a bit nervous for a collection of Golden Age mystery stories, even by someone like Sayers, who had a way of latching onto a viewpoint or subject well before others did. Then I thought again. 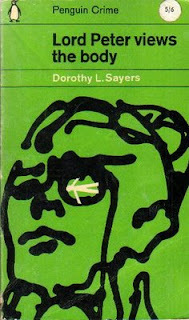 This cover, according to Ms. Cobwebs, is from a 1963 edition of the collection, which had first been published in 1928. By 1963, angst and nerviness had presumably become popular enough that such a cover might be more in keeping with the times than it would have been thirty-five years earlier. This, in turn, sparked a string of further speculation, which I will happily save for some other time. For now, this question: What book covers or jacket illustrations, crime-fiction or otherwise, have you found surprising, and why? Michael Walters posts a link to a site maintained by his book-cover designer, Richard Tuschman. The site has some gorgeous images, and Tuschman's blog offers interesting insights into the process of book-cover design. Have you read Stieg Larsson's "Men Who Hate Women"? Yes, you likely have, though you may not know it. That's the literal translation of Larsson's original Swedish title (Män Som Hatar Kvinnor) for the much-honored novel known to English readers as The Girl With the Dragon Tattoo. For now, why do you think English-language publishers decided not to translate the novel's harsh title? This is not a trick question. I have read or heard nothing on the subject, so educated guesses, provocative polemics, informed speculation and inside dope are all welcome. P.S. The Girl With the Dragon Tattoo is the first and only book of Larsson's Millennium trilogy to have been translated into English. All three books have been translated into French and German and two into Dutch. That's one area in which English does not lead the way. My review of Via delle Oche, third volume in Carlo Lucarelli's stripped-down, tensed-up De Luca trilogy, appears in Words Without Borders: The Online Magazine for International Literature. A heads-up: I liked the book a lot. Adrian McKinty pinch-hits for Declan Burke on Crime Always Pays and delivers a ringing defense of the classic English fictional detective. He offers that sophisticated, smart, unruffled figure as a kind of Mulliner's Buck-U-Uppo for a national self-esteem battered by hooliganism, economic recession, colonial guilt and Hugh Grant. It's the sharpest and funniest piece of sociological analysis you will read all day, and you can read it all here. 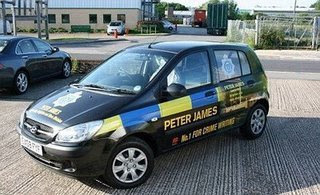 Euro Crime posts this photo and a link to this article from the Daily Mail reporting that the novelist Peter James and his publisher have sponsored a police car. The Hyundai Getz bears the usual insignia of the Brighton and Hove force, along with James' name proclaiming him "No. 1 For Crime Writing." Will the officers in the car feel any compunction about arresting Mr. James should the need arise? And will this start a trend? How long before a cop slams a perp's head into a police cruiser's roof and says: "This reading of your Miranda rights is brought to you by ... "? And now, readers, here's your chance to help answer this question. With Peter James' example in mind, give me your ideas for creative crime-fiction sponsorships. What crime writers, books, publishers and characters could sponsor law-enforcement or other services usually considered public? The top five entries will win a book from the Detectives Beyond Borders crime library, titles to be determined in consultation with the winners. Detectives Beyond Borders has heretofore restricted itself to stories with human protagonists, and the policy has been fruitful; the supply of such stories is almost endless, and some of them are quite good. Now comes J.F. Englert's A Dog Among Diplomats, and I am pleased to report that through its first 126 pages, it's better than I'd have expected from a mystery with a dog as an investigator. 1) The dog in question, a Labrador named Randolph who belongs to an artist named Harry and who also narrates the novel, is no mere wry commentator on the cute foibles of silly humans. Instead, his narration explores canine consciousness in rich detail, particularly in a series of meditations on scent. These are nice pieces of fantasy writing. 2) The opening chapters are beautifully organized, each introducing a complication, resolving a conflict, and leading smoothly and easily to another. "There was also — I began to recognize — another potent potpourri, of cinnamon, nutmeg and apple, emanating from dishes discretely placed on either side of an old wooden clock on the mantelpiece. This potpourri was called `Country Kitchens' and stunned the noses of man and canine in bed-and-breakfasts across the country." "This veneer of coziness, however, could not transform the essential nature of the place. Despite its upscale transformation and the utopian ideals of its proprietress, the boardinghouse was still a place of transience and disconnection — an urban way station filled with alien bodies in separate rooms." 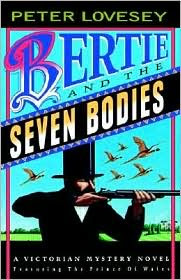 There is poignance, too, to Harry's role in the book's central mystery, a mystery that justifies the novel's inclusion in a blog called Detectives Beyond Borders. More later. P.S. A similar melancholy lurks in Ian Sansom's The Case of the Missing Books, only occasionally bubbling to the surface in the protagonist's growing disconnection from his girlfriend back in London. Such undertones help ensure that despite their lighthearted or even fantastic subjects, the books are no mere froth. Can anyone tell me what's going on in these murals — or write a caption for this odd juxtaposition? "So what is it you'll have? where we in Canada or the U.S. would reply "Just a mineral water." I don't know if this quirk of speech is Irish, Northern Irish, English, characteristic of one or another social class, or just a favorite of Ian Sansom's. (On second thought, I may have seen it in other Irish writing.) I do know it punctuates the novel and lends it a suggestion of authenticity or, God help me, texture. Certain varieties of Indian speech use the word only in similar fashion. I first noticed this tendency in H.R.F. Keating's stories, where characters say things like "I am a simple policeman only." It was easy for me to condescend to Keating, to feel just slightly uneasy with this white Englishman's imitation of Indian speech. 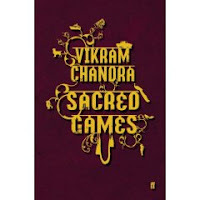 Then I found that Vikram Chandra has several of his characters use the same speech pattern in Sacred Games. More recently, as I have read blogs from India, I find that the tendency to end sentences with only appears to be a living feature of Indian English, at least around Kolkata (Calcutta) and Mumbai (Bombay). This was a rich education for me, not least because it made me repent my own ignorance in having felt morally superior to H.R.F. Keating. But this is a crime-fiction blog and not a confessional. I'll close with some questions: What role does speech play in creating setting? How far is too far when it comes to trying to capture the flavor of "ethnic" speech? How do authors strike a balance between maintaining an illusion of everyday speech on the one hand and creating memorable dialogue on the other? What happens when authors give up the effort at maintaining a balance? Who are your favorite writers of dialogue, and why? I don't know what sorts of movies Ian Sansom watched in the early 1980s, but I'd bet Local Hero was one of them. In that 1983 Bill Forsyth film, an oil billionaire sends a hotshot young executive to buy up a Scottish village where the oil company wants to build a refinery. Young hotshot is smitten with the village, billionaire with the sky above it, and all ends happily except, perhaps, for the young hotshot, who returns to America and longingly recalls his time in the village as a highlight of his life. 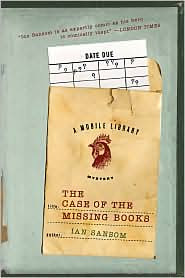 The Case of the Missing Books follows a similar course, except its version of the hotshot — a bedraggled young librarian named Israel Armstrong — stays on, and he and the village grow to embrace one another, if somewhat awkwardly. Armstrong has arrived in Tumdrum, County Antrim, Northern Ireland to take over as librarian for Tumdrum and District. Only the person who is supposed to meet Armstrong fails to show up, the library has closed, and his new job is to staff a mobile library van. Oh yes, and all the books have disappeared. In short order, Israel loses his clothes, his money and his credit cards. A vegetarian, he struggles to find nourishing food he can eat, not to mention a good cup of coffee. He has trouble understanding the villagers' thick accents and odd expressions, and he gets punched in the eye when he inadvertently spies on a pair of lovers. Beset on all sides, he agrees to stay just long enough to flesh out his résumé and earn enough money to return to London. His supervisor, as shameless a liar and as fatuous a sugar-coater as my — that is, as any corporate shill, assures Israel that "it is important for the borough to continue to provide information resources with a high service proposition combined with increased competitive flexibility." She also assigns him the unwanted job of finding the missing books and, oddly enough, Israel finds he enjoys the role of sleuth. Only most of his guesses are wrong, and just a few of the 15,000 missing books turn up. "Stripped of his money, his clothes, his dignity, unable to understand what people were talking about half the time, unwilling to eat the food, forced to be doing a job he didn't want to do, and threatened, beaten, and in a state of some uncertainty, confusion and tension, he was now really enjoying the full immigrant experience: this was what it must have been like for his ancestors and relatives who'd made it to Bethnal Green and to America. No wonder they all looked so bloody miserable in the photographs." 4) Post the next three sentences. 5) Pass the meme on to five more people, and acknowledge the person who tagged you. This meme first came my way April 22 , and my reply gave rise to a stimulating interview with Megan Abbott, whose novel Queenpin I happened to be reading at the time. So I have fond feelings toward Page 123, and I thank Sidhubaba, from the city formerly known as Calcutta, for sending it my way again. The meme has been around awhile, though, and I may be unable to come up with five people who have not been tagged already. But I am happy to fulfill the rest of the assignment, and shortly thereafter, I will add the book in question to the roster of Forgotten Books that deserve to be better remembered. The book is The Etruscan Bull by Frank Gruber. Happily, Page 123 begins with a new sentence, which means no worrying over whether a sentence that spills over onto a second page is the last sentence of Page 122 or the first sentence of Page 123. "A gun in Carmela's fist roared and a bullet kicked some splinters from the wall only inches from Logan. "Logan fired once at the car itself, shifted to cover Rocco again. `Stop him, Rocco, or you get it — "
Shooting is usually good for a dose of excitement, and the sentence's ending in a dash, breaking off before any of you find out what happens, is a nice touch. If only the Carmela in question were a woman! That might have nudged the passage into the Page 123 Hall of Fame. And now, readers, let's blow this meme to the stars. I invite all of you to take the Page 123 challenge with your current book. Let me know what happens! The events department at Detectives Beyond Borders Central Command sent this one across my desk this week. It's all about a notorious series of crimes beyond my borders, and any event taking place "under the trees" is worth checking out. So why not check it out? Crime novelist Douglas Preston’s chilling account of a legendary serial killer, known as the “Monster of Florence,” who continues to haunt the Italian police, courts, people, and himself even after 40 years. Mario Spezi is an Italian journalist who has been investigating the Monster of Florence case since the first murders in 1974. Douglas Preston and Mario Spezi will be interviewed by Sarah Weinman, author of the blog Confessions of an Idiosyncratic Mind, followed by a Q & A and book signing. Note: This will be the only venue in America here Mario Spezi will also be signing books. The Bryant Park Reading Room located on the 42nd Street side of the park — under the trees — between the back of the NYPL & 6th Avenue. Look for the burgundy and white umbrellas. Rain Venue: Library of the General Society of Mechanics and Tradesmen 20 West 44th Street (between 5th & 6th Avenue). New York City. A reader in Florida knew that Tana French credits her training in theater with helping her create her characters. His knowledge wins him a copy of French's novel In the Woods, newly released in paperback in the U.S. by Viking Penguin. Talk about making a splash! Tana French's debut novel, In the Woods, has been garnering praise and honors in numbers known in the publishing trade as "out the wazoo," an Edgar Award for best first novel among them. Now you can find out what the fuss is about without having to spend one thin dime. Tana French has credited her training and experience in a previous profession with helping her writing. What is that profession? I urge you to read Patti Abbott's Forgotten Books posts religiously. Each week she asks readers, writers and bloggers to post a short essay on their own blogs about a book that deserves to be better remembered. She then compiles lists of all the essays in a weekly summing up that is the only shopping list a serious crime-fiction fan will ever need. And it renews every week! Why the excitement? Because the lists are a good idea, but also because I've used them. An author I had not heard of previously stuck in my mind from one of the lists. His name registered when I found an old copy of one of his novels at Philadelphia's own version of Aladdin's Cave, otherwise known as Port Richmond Books. I pulled it off the shelf, found a grabber within the first two pages, and bought the book. So, guarantee yourself a fistful of pleasant surprises every week, and don't forget to read Forgotten Books. The U.K.'s Crime Writers Association has announced the shortlists for its Dagger awards, which are to be presented in London next month. The lists include two subjects of 2008 Detectives Beyond Borders interviews: Sian Reynolds, nominated with Fred Vargas for the Duncan Lawrie International Dagger for her translation of Vargas' This Night's Foul Work, and Matt Rees, up for the John Creasey (New Blood) Dagger for The Bethlehem Murders (The Collaborator of Bethlehem in the U.S.). A year ago, I asked readers to name their choices for the most influential crime writer ever. Here's another name for the list: Jean-Patrick Manchette. Manchette reinvigorated noir, inventing what French critics call the néo-polar, or neo-whodunnit, and if all that neo stuff makes you roll your eyes, stop and think for a minute: How many of the old-time hard-boiled writers make your blood run cold the way they presumably did for readers in the 1930s and 1940s? How mean, in other words, are Raymond Chandler's mean streets today? Certainly Manchette's time, an age that saw assassinations, cover-ups at the highest levels, and revelations of the violence that attended colonialism and its end, could no longer be shocked by small-town or even big-city corruption of the Hammett and Chandler kind. Manchette restored that ability to shock, with tales of what power can do to those it finds convenient to crush. And he did it while remaining true to the roots of pulp. Heck, the guy even loved American movies and played the saxophone. How much more genuine can you get? I was reminded of Manchette twice recently. The first reminder came in Duane Swierczynski's novel The Blonde, which names a character, or rather a part of a character, after Manchette. I suspect Swierczynski would not call himself a political writer. Still, he was attracted by Manchette's non-stop, man-on-the-run plots, and something of their energy infuses Swierczynski's own work. As for Manchette's influence, how about Carlo Lucarelli's De Luca novels? And here's an open-ended set of questions for you, readers: If you've read Manchette, what's your take on him? If not, let's revive the old question of who the most influential crime writer is, only with a twist: Who is the most influential crime writer since the end of World War II? And why? Declan Burke, of The Big O and Eightball Boogie fame, is a pretty busy guy these days, putting out a novel and raising an adorable, brand-new baby daughter. Thanks to the blogosphere, you can watch his progress at one of these tasks, as you follow him through A Gonzo Noir. Come to think of it, you can watch his progress at both of these tasks. Michael Walters takes us to Mongolia for an opposing view to that put forth by the pro-spring lobby. Rhian, keeper of It's a Crime! (or a mystery...), has been blogging about the Hay Festival for the BBC, which I think is way cool. That's Duane Swierczynski (right) being grilled by Ed Pettit at the first Noir at the Bar reading this evening at the Tritone in Philadelphia. Duane and Ed had the delightful idea of turning the reading into an event. So, instead of just an author reading his own stuff, Duane talked about his work and about his view of noir; Ed's actress wife, Kate, read the first chapter of Severance Package (you'll never guess what the murder weapon is); and Ed interviewed Duane, who then took questions from the audience. The ambiance, too, was slightly rowdier than one normally finds at readings (The Tritone is a bar, after all), though I was pleased to note that even the bar's regulars paid respectful and interested attention. The crowd? At least as good as expected, according to Rick at the Tritone, so stay tuned for Noir at the Bar II. A special treat for me was the attendance of Philadelphia writer Johnny Ostentatious, who presented me with a copy of a novel of his, for which I'd done the copy editing. It was nice to see my name between covers. It's been to Canada, Germany, Ireland, Texas and South Philadelphia. Now the Carnival of the Criminal Minds puts down stakes in England in the form of Martin Edwards, author of mysteries set in the Lake District and Liverpool and blogger under his own name at Do You Write Under Your Own Name? Martin's carnival begins with a Beatles memory before taking readers on a tour that includes the Byzantine empire and a muddy island, among other stops in Crimefictionville. The tour includes a number of stops outside the world of crime fiction for those of us who need reminders that there is such a thing. I'll see you on the midway. As always, visit the Carnivals of the past at carnival queen Barbara Fister's carnival archive.